I would like to create manually the frequency separation layers, as I prefer to use median blur instead of gaussian blur, but somehow I get stuck on apply image as it as fewer options than Photoshop. Can anyone point me to a tutorial or some resources as how I can do this? Thanks but that is the automatic way, and not what I'm looking for. I'm not sure what you mean by manually doing this. Is this the video you say is of no help? Let me explain a little better. In Affinity, you just got to Filters/Frequency Separation and that's it. 4 - change the top layer blending mode to Linear Light. Now, what I'm looking for is to recreate the steps on the photoshop, specially the step 3. Why? Because I don't like the gaussian blur and prefer to use median blur, and the Affinity filter uses gaussian blur. So the problem I have is with Apply Image. It doesn't have the same parameters as Photoshop, and I cannot recreate the effect. If you don't like the built-in low frequency result, can't you simply delete that layer, paste the original image back in and apply the median blur that you prefer? That wouldn't work because you have to split the image in a way that both layers, Low and High, when combined, form exactly the original image. By adding a new layer with a different blur and not subtracting it from the base image you're just adding additional information to the image that wasn't there in the first place. I see, thanks. I thought I might have been missing something! That is an interesting approach but not what I would call "Frequency Separation". It seems consistent with what this "Ultimate Guide" suggests, except for the type of blur applied. 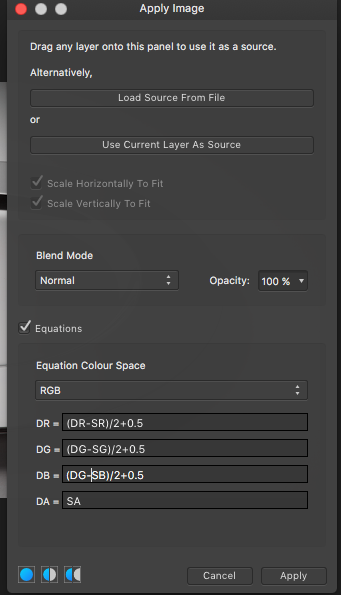 I tried to duplicate that guide's 'Apply Image' method's steps in Affinity Photo but got stuck at step 3 -- I have no idea if there are equivalent settings in AP's "Apply image" filter for the ones shown for PS for scale & offset. Nothing I tried resulted in the high & low frequency layers I created using the guide's approach combining to look like the original image, as suggested in its step 4. I guess there must be a way to do it, since the Frequency Separation filter in Affinity Photo does it. I suppose, but it still doesn't sound right. Issue solved! This is useful to subtract one layer from the other, for example for Frequency separation. Hope this helps for future reference. MartinsRibeiro: Great work figuring this out!!! I tried making a macro to do your steps and almost succeeded. The problem seems to be in your step 4: I can select the blurred layer as the source by dragging it into the Apply Image window & I can apply the equations without errors while recording the macro, but it doesn't actually seem to be using the blurred layer as the source -- I just get a uniform 50% grey layer. My guess is that the macro can't, in its current fairly crude state of development, actually record the drag & drop action so the source channels are undefined or something. However, doing all your steps manually works perfectly. I've also tried a macro and what I found out is that the action memorizes the content of the layer used when creating the macro. Try using the action on a different image from the one you used when creating the macro and check it out. So the next step is to improve the macros to use the apply image. Yes, it is as you say, or it least it is after I fixed a stupid error I made in the macros I was experimenting with. Doh! It is a pity the only option in the macro for the Apply Image filter is setting the opacity. If it just had an option to allow the user to select the source image when the macro ran, it would be a workable solution. I've already posted a feature request with exactly that. Let's hope it comes out in the next update. For what little it is worth, I added a "+1" to your feature request & a link back to this topic. I know the developers have said they want to improve the macro feature in the future, but it is unclear if that will happen in a 1.x update or in a 2.x paid upgrade. I am guessing that will include better editing for saved macros or when recording new ones (like being able to add, delete, or change a step anywhere in the macro) & maybe some more powerful features like conditionals, loops, & branching, as well as giving us more options for actions currently supported. Apparently, Affinity makes the high pass layer by inverting the low pass layer, and blending it with the original layer (50% opacity, normal mode). When it is going haywire in LAB mode, it is setting the opacity of this inverted low pass layer to 100%. I tested it with median blur as well and it works great. I agree that the median blur works better in many cases than gaussian due to less smudging of color. Also, a lot less color ends up in the high pass layer with median blur. Finally, if you want to isolate color in a separate layer, or strictly in the low pass layer, use LAB mode and do the frequency separation on the luminosity layer. Works great in my experience. Isolating colour to the low pass layer will finally make frequency separation properly useful. Does anyone happen to have a step-by-step idiots guide as to how to accomplish this? 1. Convert your image to LAB mode. 2. Duplicate the layer, and name the lower one "L" (luminosity) and the upper one "C" (color). 3. Go to the channels studio for "L" and click on the "..." for AOpponent, and click "Clear". Do the same for BOpponent. 4. Go to the channels studio for "C" and click on the "..." for Lightness, and click "Clear" and then "Invert". 5. Change the blend mode for "C" to "Color". 6. Duplicate "L" and name the lower one "L blur", then apply a blur filter of your choice (Gaussian or median, etc.) to this layer. 7. Create a new group named "High pass" and place "L" inside it. Then, duplicate "L blur" and place it above "L" (inside the "High pass" group). 8. Go to the channels studio for the copy of "L blur" inside the "High pass" group, click the "..." for Lightness, and click "Invert". Set the blend opacity to 50% (blend mode normal). 9. Set the blend mode for the "High pass" group to linear light, and then rasterize the group if you wish. !! I 'm so glad I asked... There is absolutely nooo way I could have worked all that out by myself! Thank you so much for this step-by-step. Now to give it a whirl. @Fotoloco Great stuff - but which "L" layer should be one to apply corrections ? Well Done Martin! I was looking for this. Excellent job! Thank you!